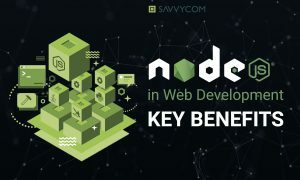 With the advantages of being lightweight, scalable and many others, no wonder Node.js web frameworks are rapidly gaining attention and becoming the go-to option for developers at the present. With the advantages of being lightweight, scalable and many others, no wonder Node.js web frameworks are rapidly gaining attention and becoming the go-to option for developers at the present. In this article, we will introduce the three most popular web frameworks in Node.js (Express, Koa and Hapi) and how to differentiate them to pick the right one for your project. Express.js is the simplest, fastest and probably the easiest Node.js framework to use for developers. It provides various functions to build single-page apps, multiple-page apps or even hybrid web applications. It also serves as middleware to help manage servers and routes. Express has the biggest community of users out of all existed web application frameworks for Node.js, with a history of over 9 years of development behind it. Many of its members praise that Express.js is a good and powerful tool, and it does do a good job. Because of its simplicity, Express.js is very user-friendly and can be applied successfully by inexperienced people. It also helps simplify the testing process and improve application performance. Despite that, with a powerful rooted API, various tasks can be performed including building an Express.js RESTful API server and routes for simple web applications. Additionally, it’s extremely easy to integrate with third-party services and middleware as Express.js makes use of the Node.js manager package node. While it is a convenient and easy-to-use tool, Express.js does have some drawbacks. One of those is the lack of a recommended method of organisation, which can be a problem for developers as they’re unable to repair the projects if needed. Therefore, it is important to be very clear about the approach when maintaining the code. Furthermore, Express.js required a lot of manual labour-intensive tasks since you need to create all endpoints. Unless it’s handled professionally, the problem can affect a great deal to your memory usage. For small and middle-size projects, Express.js would be a suitable option. Some of the examples that can be named are MySpace, PayPal and Klout sites, which all use the Express web framework as a middleware framework. However, if you’re going to develop a complex project with a large development team, Express.js may not be the best tool to use. Koa was developed in 2013 by the same team that introduced Express, with a purpose to become smaller, more significant than Express. 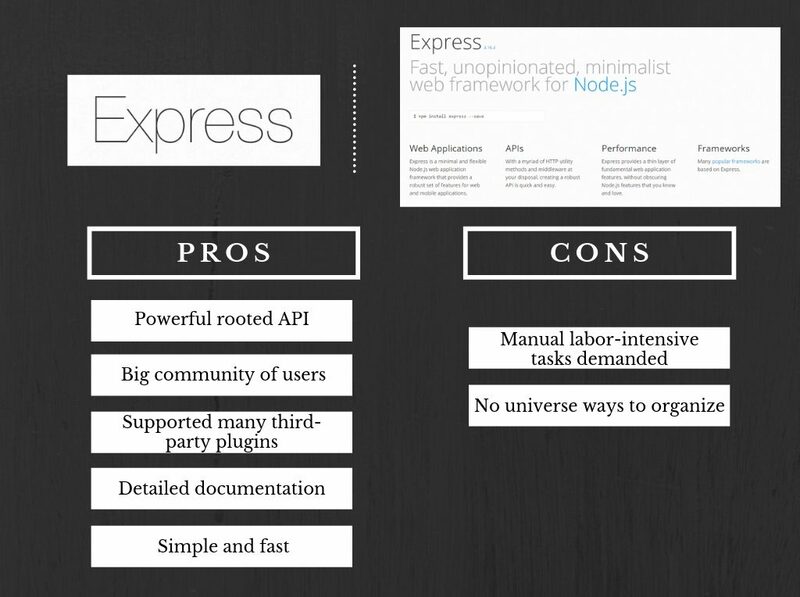 The team referred this Node.js framework to be one of the best Express.js alternatives. Because of Koa’s unique script and methods, it enables the framework to work on different browsers. As it does not bundle any middleware within its core, Koa provides a way to make writing servers fast and joyful. By taking advantage of ES6 generator feature, using Koa will help you avoid callbacks and build web applications with great performance. Besides, it makes the coding management process easier. Hence, you can easily handle errors faster. Moreover, with just over 500 lines of code, Koa is an extremely lightweight framework, making it a special point of this tool. Overall, Koa brings a faster and easier experience when picking (or writing) middleware for first-timers, rather than compromising with middleware like Express or Hapi. Despite its pros, Koa still presents some hindrances. As it is the newest out of three frameworks (Express, Koa and Hapi), the open-source community revolving around Koa is relatively small. Therefore, it suffers a shortage of support from its web framework community. In addition, Koa.js is still unstable. 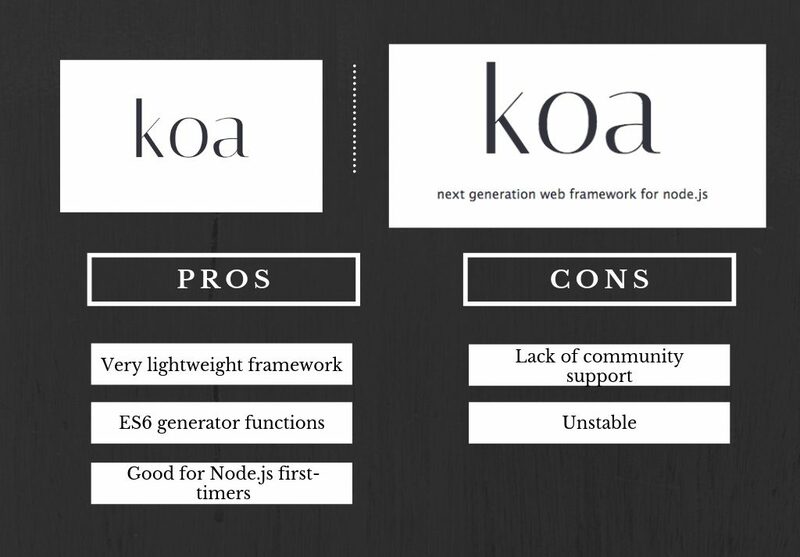 Using the ES6 generator, which is way above of the game, means that Koa framework is not compatible with any types of Node.js framework middleware existed. As Koa.js is a lightweight and modular framework, you can create a web application from scratch, upon request and without tonnes of unwanted materials. 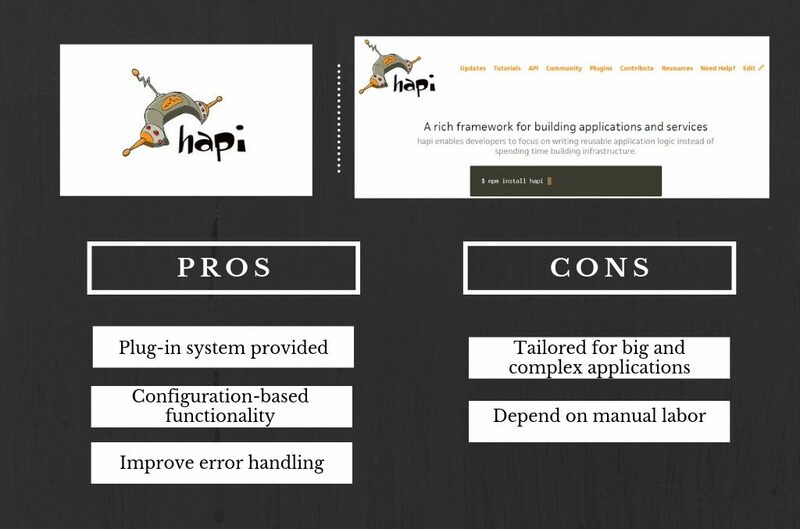 Hapi was originally built on top of Express in 2011, but later it was developed into its own framework. Hapi.js is mainly used to build applications or services and it helps developers a great deal to pay more attention to writing application logic tasks instead of building infrastructure. Hapi is Node.js framework with a powerful provided plugin system, therefore developers can add new features or fix bugs at a fast pace. As well as that, Hapi can assist you to manage the whole development process easier. As Hapi allows developers to have deeper control over request handling, building large scale or enterprise-sized applications is a piece of cake. On top of that, as this framework is based on configuration rather than code, Hapi.js adds consistency and reusability to the developing process. Apart from being a useful tool in creating customized construction blocks, Hapi does have a considerable minus. This framework relies heavily on manual labour, which means you’re on your own to figure out how to use them. There are a lot fewer samples or open-source applications that use Hapi, so the project may involve developers more than when using third-party middleware. As Hapi is tailored towards big and complex web applications, if you’re in the process of building one app like that, you should definitely go for this framework. With the back-up of WalmartLabs and many other large companies that have already used Hapi, you can rest assured that this web framework has been tested and ready for any heavy tasks. We hope that this article will somehow help you in the progress of developing your own web application. 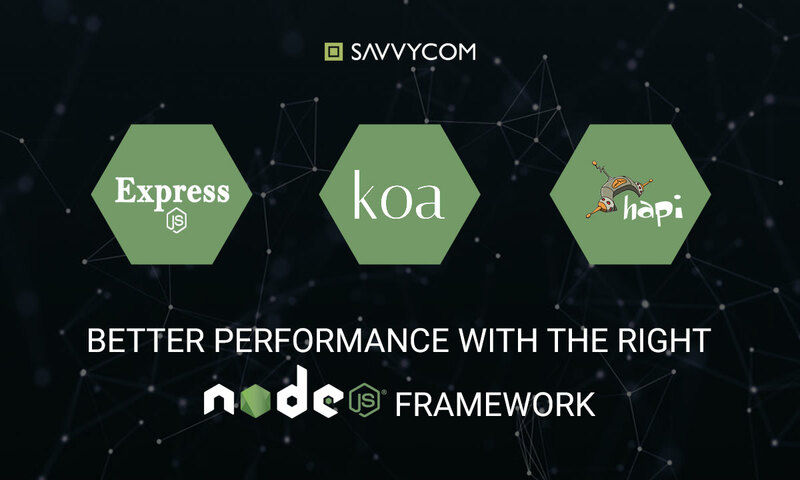 For further information about Node.js web service, feel free to contact Savvycom to book a meeting. We’re happy to discuss with you to find out the right Node.js web developer for your project or lend you our professional and expert developers.